Finn is a eight-month-old German Shepherd puppy. His owners called me to stop his pulling on the leash, digging and a few other behavioral issues. When I arrived for the session, Finn greeted me at the door with a nice medium energy. He was excited in a puppy way, but not overly so. As I discussed the situation with his owners, he showed good confidence and social interaction. Finn’s owners had a number of rules in place which is not usually the case for my clients. Their primary concern was getting him to pay better attention, especially outside, and stop the pulling on the leash. I showed them a few leadership and focus exercises to help develop his attention span and ability to self restrain. Finn picked up on these right away so I quickly coached his owners through the exercises and then gave them some tips on how to increase the level of difficultly as time goes on. While exercise is an important element in any dog’s life, mental stimulation is just as important. 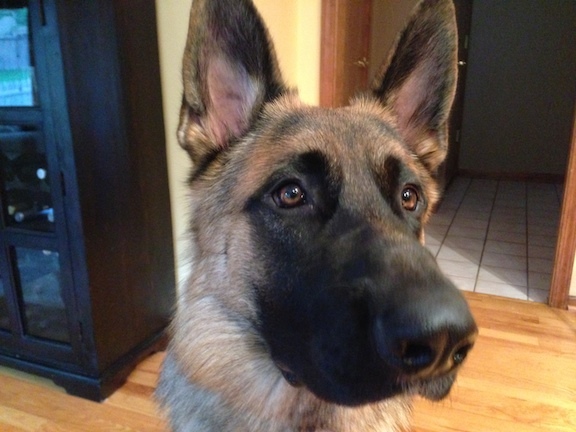 German Shepherds are knows as intelligent dogs, so I suggested a few interactive toys and games to help challenge his brain and give him a mental workout. Next we went out to his back yard to work on getting Finn to focus amongst distractions. At first, Finn was hesitant and needed some coaxing. But as we repeated the process and his confidence level increased, so did his enthusiasm and responsiveness. I suggested they practice these exercises daily over the next few weeks and months to help condition Finn to respond to their commands no matter what other activities are going on around him. All that was left was to address Finn’s pulling on the leash. I suggested that they practice a structured walk where Finn was expected to follow three rules; stay in his position, keep his nose off the ground and no marking. These rules don’t apply to every walk, just the one where his owner wants to reinforce the leader follower dynamic or for training to heel. Because scent is a dog’s dominant sense, its important to let a dog sniff around. But when practicing the heel, its important to keep a dog’s nose up as the nose controls 60% of a dog’s brain. I fitted Finn up with a Martingale collar and added my special twist to the leash before heading out for a short demonstration walk. Finn fell into a perfect heel and stated there as I walked back and forth in front of his house. I handed the leash over to his owners who took turns walking him. They were elated that the Martingale completely stopped the pulling. Because his owners were no longer worried he would try to run off if he saw a rabbit or squirrel, their confidence was high. This had a positive impact on Finn and will continue to impact him in a good way on future walks. When we returned to his home, Finn was pooped. He isn’t a bad dog. Just an inquisitive pup who needed a little more leadership and guidance from his owners in a way he understood.